Wrist pain is common. Wrist pain starts for many reasons including trauma, overuse and disease, but I think we often overlook its importance when there isn’t an obvious injury like a fall. The emphasis for many sports and fitness enthusiasts, both consumers and providers, is on the bigger, perhaps more impressive structures. Sure, there are many articles on the web about grip strength, and forearm strength, but what I see as missing from many of these articles and blogs is any attention to the ‘non-muscular’ structures, like tendons and fascial integrity of the retinacula. These connecting structures that provide stability and ‘packaging’ for the mobile structures like joints and muscles have an unglamorous image. Wrist pain is amazingly frustrating to anyone who suffers from it, but especially to the active and fit because it inhibits or prevents almost every they do, from dressing to lifting their favourite weight to leaning on the wrist to perform a press-up or sprint start. One common problem is strain of the ulnar collateral ligament (often called the styloid ligament), on the outer (ulnar), side of the wrist. It usually starts after overuse or strain of the wrist, perhaps as when over-stretching the grip and especially when cocking the wrist sideways. 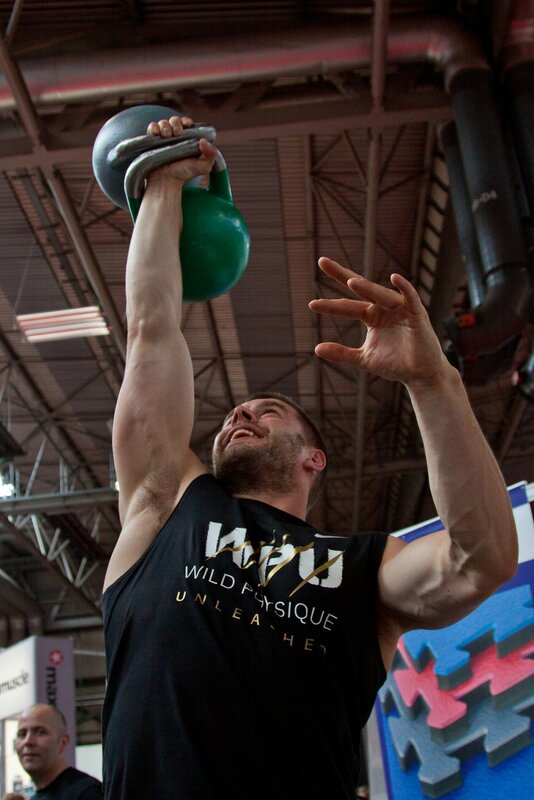 You will note that Matt’s wrist, although subject to the stress of an off-centre 44kg load, remains aligned with his forearm and is not deviating to either side. So, why does this ligament give so much trouble. It is small, short and rather insignificant looking. The styloid ligament is a rounded cord, attached above to the end of the styloid process of the ulna, and dividing below into two fasciculi, one of which is attached to the medial side of the triquetral bone, the other to the pisiform and flexor retinaculum. In other words, from the end of the outer forearm bone to two of the wrist bones and some fascia. So why does it matter if it small, short and insignificant? Well, small doesn’t just have to beautiful. It can be functional and vital as well (and I did say insignificant looking!). The answer is in its role in stabilising for the wrist, prevention of excessive radial deviation and helps in the limiting over flexing of the wrist. (Remember it is blended with the flexor retinaculum). In anatomical terms it is very complex and forms part of the triangular fibrocartilage complex. In functional terms, the TFCC forms a cushion for the end of the ulnar bone and is a major stabiliser of the wrist. So what happens when you stuff it up? First, there is pain, particularly on wrist flexion and ulnar and radial deviation (sideways motion). Extension tends to feel sore and compressive rather than sharp, like the other movements. Second, swelling and sometimes heat is seen over the outer side of the wrist. The whole wrist, hand and even forearm may feel stiff and ‘full’, as if pumped up, but not in a healthful way! Third, you may find it confusing; overall grip might feel reasonable, but pinching index and thumb together can be really sharp. There may well be lots of clicking across the joint, especially if you twist the wrist. It is not necessarily painful, but a bit disturbing. The elbow may well click also. Fourth, painkillers may not be all that effective and finding a comfy position is hard to achieve. All these features and no doubt many others, are ‘normal’ for sprains and strains. They are however a message not to plough on regardless. Symptoms should be settling over a matter of days as long as you use common sense practice – any longer than a week, the suspicion must be that it is more than a sprain. Self treatment includes the old faithful’s of R.I.C.E or Rest, Ice, Compression and Elevation. The example on the right is a bit extreme (I’m sure you will be a lot neater), but you get the idea. Keep the joints moving with plenty of articulation WITHOUT LOAD, strip out any trigger points you may have in your forearms with a TPT ball (I recommend the one from this link), or just deep thumb pressure assuming you haven’t rogered the other wrist as well. Slowly reintroduce exercise with some gentle weight bearing, perhaps with the wrist strapped initially and do take your time. It is worth remembering that ligaments do not have a good elastic limit, like muscle and tendon fibres. The relevance of that is that if you overstretch a ligament badly, continue to over-stretch it or ignoring these injuries, they will become less and less competent. And we don’t want that do we? Keep well and strong. Contact me here if there are any questions arising from this brief offering. I am 52 years old. Recently, I have asked myself, what do I want from exercise? My history of sport, physical exercise, competition, health and health needs are probably quite typical! Tall and strong at a young age, I was good at contact sports, particularly rugby and field athletics – running at someone, throwing anything and jumping were all fun for me. It was all about strength, condition and being bullet proof. Dislocated left shoulder – shrug it off! Torn right knee cartilage – move on! Concussion – shake your head and get back up again. Then, work and career started to get in the way. I married. We started a family. Professional training. Change of career. More qualifications. Walking with the kids and dog don’t really count, do they? Sport and exercise got put aside. Twenty years pass. Sporadic attempts at gym, squash, circuits, and the rest. The kids grow up. Then, “40 years old” arrives and passes. Time to get rid of the growing belly. Back to the gym in earnest. Boring, boring, boring! Too many ‘beautiful people’ who put me off and seemed so judgemental at my lack of focus and progress. Looking back, the problem was me not knowing what I wanted. Next? A chance conversation and I was introduced to mountain biking. Now, this presses the right buttons! Wonderful and refreshing in its freedom and variability. Expensive, mind you! Great for aerobic fitness, balance and stamina – but ultimately, you get fit for what you are doing. The activity doesn’t matter; tennis, running, rugby, and the rest – all wonderful but something was missing – I could bike a steep hill with the best and the rest, but couldn’t run up the street without puffing. The fitness was too specific, too focused. It took another injury, severe this time, to make, no, force me to think about what I was doing. In my case, I came across kettlebell and body weight training and this works for me, physically and, more importantly, mentally. I enjoyed it and continue to enjoy it. Total body workout, flexible, aerobic and balanced. You can go heavy or light, hard or gentle. Frankly,what works for me doesn’t matter – at my age so many people are searching for a specific or magical regime or principle that they can work to, a set of rules that they can follow. Well, let me spell it out – THERE IS NO SUCH THING! Human beings are just too variable, we all have the baggage of our particular genetics, history, fears and wants. This means that even when we exercise in a group, there is a huge range of variability and you have a responsibility to look at what is both good and safe for you to engage in. If this wasn’t true we wouldn’t have specialist participants, (who ‘play to their strength’), in every team sport that I can think of! Why, then do we imagine that synchronised mass step aerobics, for example, is suiting everyone and yet you don’t see anyone doing their own thing. Peer pressure – think for yourselves! Most, if not all of this more mature age group, carry injuries. Most will have arthritic changes. The fast, twitch muscle fibres are fast disappearing. Recovery times are longer even just after each training session, let alone injuries! Then, if that is not enough, even those who manage to get to a class, (of whatever type), are so often greeted by these lovely specimens of male and female beauty and physical perfection! It’s enough to make you run a mile. BUT DON’T, please don’t. Don’t blame the trainers for your lack of success in class or even for putting you off from taking up a class.